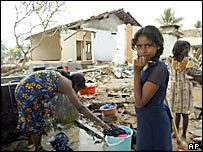 More than 30,000 people died in Sri Lanka in the tsunami and over 5,000 people are still missing. Many bodies are dumped in mass graves and some will never be found. Survivors need to start rebuilding their lives, but one Sri Lankan doctor warns this can not be done until they can start the grieving process, a process hampered in many cases by the lack of a body. Dr Jayantha Thambar, a GP, said the broken bones and wounds suffered by his patients were starting to heal, but the psychological trauma would take much longer. He said he had been greatly moved by the cases he had seen and the memories would stay with him: "I saw an eight year girl who had lost her father much earlier, lost her mother in this wave - and came shivering in the rain to our field clinic by herself for treatment. "I saw mother who lost her daughter still experiencing shock and a numbing of emotions, and a father who lost his children (twins) and wife. He is now guilty that he is alive and didn't do enough to save them. "Overall there is a general sense of hopelessness in the refugee camps." He said some overseas aid groups had already started training locals in befriending survivors, but said much more needed to be done. "Initially we had patients coming into the hospital with bruising, cuts, fractures, crush injuries. "Later on they had upper respiratory tract infections, diarrhoea. "People are slowly picking up the pieces. Rebuilding of lives and property must begin, and it is. "But there is a lot of psychological trauma." He added: "Sri Lankans have a rich grieving process with elaborate funerals for the dead. "However most people who died were buried in mass graves or are missing, denying the loved ones of this process of grieving." Dr Thambar, a GP in a clinic in Colombo, the capital of Sri Lanka, just 100 metres from the affected coast, said that some aid groups were offering training in counselling, but said more was still needed and it was an area of recovery that was being overlooked in many cases. "There is a need for psychologists and psychiatrists, but they need to be able to understand the local culture and language if they are really to help in counselling. "Some of the aid groups have been holding training sessions for interested people and I think that is good, although further training and awareness sessions could be held for teachers, community leaders, religious leaders and health personnel so that they can be better placed to help the locals. "Befrienders are better than counsellors in this situation." Dr Thambar, who was at home when the tsunami struck, said initial medical care had been hampered by the devastation wrought by the waves. It took time for the medics to get supplies and get organised. He said that in the first few hours ad hoc arrangements were made to provide primary care facilities at the refugee camps. The more serious cases were taken to hospitals, but that in many cases this had been very difficult. "Transport was hampered by a breakdown of roads, vehicles and limited able people to transport the injured. "Initially the armed forces, groups of individuals and non governmental organisations took charge, but later the government swung into action. "Some of the hospitals were damaged and non functional and many of the health care staff were displaced." He said many doctors ran short of tetanus jabs and antibiotics but said that the clinic where he was working, in the disaster area, was coping although there were concerns that medical aid might not be getting to all the areas where it is needed. "A lot of aid has been received in the main ports of entry. However we are concerned about the misdistribution of the aid and areas of low distribution especially to the North and East of the island." He said the islanders needed to look forward, but many feared the money donated to help them do this would be squandered. "On a national scale there needs to be a plan for the rebuilding process which the authorities have come up with. However, many Sri Lankans are sceptical of the proper implementation of the plan and fear that all the aid could be squandered. "The country needs to set up primary care systems to deal with the anticipated health issues and to form a base for future health care provisions and to reduce the reliance on specialisation and tertiary care." He said he could not understand what had happened, but said his love of God was giving him the strength he needed to carry on. "It is a pity that we couldn't have had an early warning system or been forewarned by a responsible body of the formation of the tsunami after the earthquake. 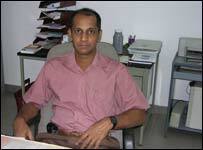 "There was a time lag between the disaster affecting the different parts of Sri Lanka. However due to poor information the population could not be alerted. "It highlights the need for humanity to stand together, share information, breakdown barriers that heighten disparity between the haves and have nots. "We need to work hard to ensure basic facilities for all. "I have a belief as a Christian of a loving God, very much involved in the affairs of the world. Though I cannot understand why this has happened I can continue to cling to that belief in him. This gives me hope."